A pile dwelling settlement 5,000 years ago may have looked like this. The National Museum Zurich houses one of the oldest preserved doors in Europe. 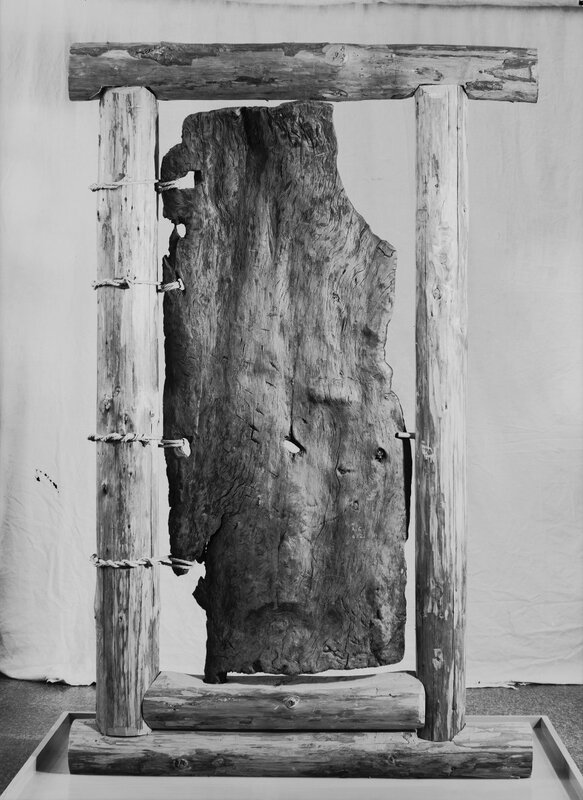 The Robenhausen door is more than 5,500 years old. It must have been a huge surprise to Mr Messikommer, farmer and pile dwelling archaeologist from Stegen in Wetzikon, when he came across a large wooden board during excavations in the marshes at Robenhausen (Robenhauserried) in mid-June 1868. What he initially took to be a box lid or a bench turned out, on closer inspection, to be a door. It was the early days of prehistoric research in Switzerland. The timber piles and clay and stone objects found along the banks of the Mittelland lakes had first been associated with prehistoric villages by Ferdinand Keller, President of the Antiquarian Society in Zurich, in 1854. His verdict created a veritable ‘pile dwelling fever’. Searches, excavations and studies were carried out around lakes throughout Switzerland, including in the Robenhausen marshes at Lake Pfäffiker (Pfäffikersee). Pile dwelling archaeology was born, and Jakob Messikommer and Ferdinand Keller were among the pioneers of this new science. The finds from Robenhausen quickly became world-famous, and the term ‘Robenhausian’ became synonymous with a specific period in human history. The wooden door from the Robenhausen marshes was brought to the attention of experts, and later incorporated into the collection of the Swiss National Museum and put on public display. But the story does not end there, because the door still holds some secrets. The door is 1.60 m high and 65 cm wide. Its thickness varies between 3 and 6 cm. The spur – in the lower part of the door panel – originally sat in the sill and acted as a pivot. The holes along the left side of the panel suggest that the door was additionally affixed to the door frame with leather strips or cordage. The door is made from the sapwood of a large silver fir. This means we are not dealing with a plank that has been cut out of a tree trunk. Rather, it is the outer layer of wood from the trunk (known as the sapwood), which was split off from the trunk and then compressed flat. In the age of circular saws and prefabricated panels, this procedure may seem a bit complex. But it is a very effective way to quickly produce boards that are both wide and thin. Speaking of age, just how old is the Robenhausen door? In the century before last, Jakob Messikommer and Ferdinand Keller went no further than characterising the door as prehistoric. Today, we know there were successive villages in the Robenhausen marshes over the period between approximately 3,700 and 1,000 BC. Logically, therefore, the door should date to somewhere in this span of time. It could be Neolithic, but it could just as easily be from the Bronze Age. But we can be more precise. 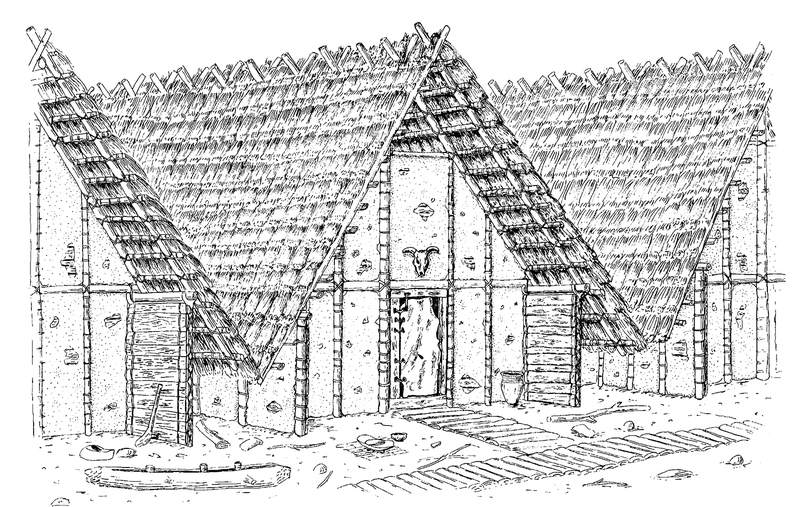 Attempted reconstruction of a house from the Pfyn culture with Robenhausen door added. These days, archaeology has a host of methods with which specific objects can be dated. Using tree-ring dating (dendrochronology), for example, it is possible to date wooden piles and boards exactly to the year. However, this requires as large a number of tree rings as possible, which the door, due to its method of manufacture, unfortunately does not have. A more appropriate method here is radiocarbon dating. Using this method, objects made from organic materials such as wood or bone can be accurately dated to within a few decades. In 1998, two small wood samples were taken from the door and sent to the radiocarbon lab of ETH Zurich. 130 years after its discovery, archaeologists received the long-awaited answer to their question: the door dates from the period around 3,700 BC – the Neolithic period – and belonged to one of the earliest houses at the site. But the Robenhausen door is not the only one of its kind. In recent years, further Neolithic wooden doors have in fact come to light in archaeological excavations: another one at Lake Pfäffiker and two in Zurich, during excavations on Sechseläutenplatz. These doors are fascinating objects, because not only are they tangible witnesses to the prehistoric houses and their features, but they also impressively demonstrate the skill of the prehistoric craftsmen. For an exhibition in the 1950s, the door was mounted in a reconstructed door frame. 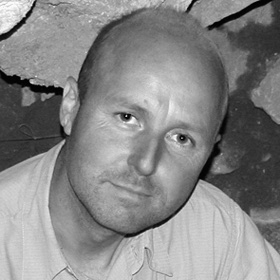 Samuel van Willigen studied prehistoric archaeology and works as a curator at the Swiss National Museum.